Extreme weather is a meteorological event that falls outside the realm of normal patterns. Weather describes conditions in the Earth’s atmosphere that occur over a short period such as days. Climate describes the weather that occurs over a longer time such as decades. Climate affects weather. For example, weather in the temperate areas is more variable than at the equator or the poles. Since 1900, the climate has been changing more rapidly than in the past. The average earth temperature has increased by 1.2 degrees Celsius since then. The two poles of the earth have been affected the most by climate change. The change has caused more frequent and damaging extreme weather. The cost since 1980 has been $1.6 trillion. Any list of extreme weather events includes tornados, wildfires, hurricanes, blizzards, floods and landslides, heat waves, and droughts. Extreme weather includes storms, whether they be dust, hail, rain, snow, or ice. What makes a weather event extreme? A storm becomes extreme when it exceeds local averages or sets a record. Extreme weather in one location may be normal weather in another. For example, a heavy snowstorm in January is extreme weather in Scottsdale, Arizona, but not in Boston, Massachusetts. High impact events that create a lot of death and damage are extreme. In 2019, snow fell at a record-low elevation in Hawaii. In 2014, blizzards hit the Midwest, shrinking the economy by 2.1%. The warming Arctic has increased the frequency of blizzards in the northeast United States and Europe. When the Arctic suddenly warms, it splits the polar vortex. That's a zone of cold air that circles the Arctic at high altitudes. When it splits, it sends its freezing temperatures southward. When it meets moist air from the warming oceans, it creates a bomb cyclone that dumps massive amounts of snow. In July 2018, heat waves set new temperature records all over the world. Death Valley had the hottest month ever recorded on Earth. The average temperature was 108 degrees Fahrenheit. In China, 22 counties and cities almost reported their hottest months ever. Several cities hit all-time temperature records, including Los Angeles at 111 F, Amsterdam at 94.6 F, and London at 95 F. Ouargla, Algeria, reached 124.34 F, the highest temperature reliably recorded in Africa. On August 12, 2018, Glacier National Park in Montana hit 100 F for the first time ever. That same year, wildfires engulfed the American northwest and California. The frequency of western U.S. wildfires has increased by 400% since 1970. These fires have burned six times the land area as before and last five times longer. Their fierce temperatures consume all nutrients and vegetation, leaving little to grow back. The fire season itself is also two months longer than in the early 1970s. In 2010, massive wildfires in Russia devastated crops. That helped send global food prices up 4.8% in 2011, contributing to the Arab Spring uprising. In 2015, California's sixth year of drought cost $2.7 billion and 21,000 jobs. The 2011 tornado season was the worst in history. In one week in April, 362 twisters hit the Southeast, causing $11 billion in damage. In May, the single most destructive tornado in history hit Joplin, Missouri. It killed 161 people and cost $3.2 billion when adjusted for inflation. That same year, the Mississippi River flooded in a 500-year event that cost $2 billion. Hurricane Irene cost $45 billion in economic damages. In 2008, Southern China experienced the highest rainfall in history. It ruined crops on 860,000 hectares of cropland. Heavy rainfall in the Midwest caused flooding, resulting in the destruction of 12% of crops. Warmer Arctic temperatures have destabilized the polar vortex. As a result, portions have split off and blocked the jet stream. That’s a river of wind high in the atmosphere that races from west to east at speeds up to 275 miles an hour. It undulates north and south as it goes. The jet stream is created by temperature contrasts between the Arctic and temperate zones. The Arctic is warming faster than the rest of the globe. That slows down the jet stream and makes it wobblier. When it wobbles down, it brings cold Arctic air into temperate zones. When it wobbles up, it brings warmer air into Alaska, Greenland, and Iceland. Things are about to get much worse. As the Arctic warms, the sea ice melts. Dark water absorbs more heat than white ice. As a result, Arctic temperatures are rising twice as fast as the global average. That will only make the jet stream slower and wobblier. 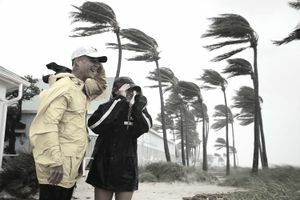 The National Oceanic and Atmospheric Administration has identified the average cost of extreme weather events. Between 1980 and 2018, there were 241 events costing more than $1 billion each. The total cost was $1.6 trillion. The most damaging events are hurricanes. Since 1980, hurricane damage has totaled $919.7 billion and killed 6,497 people. The three most expensive storms have all occurred since 2005: Katrina at $160 billion, Harvey at $125 billion, and Maria at $90 billion. Tornados, hail storms, and thunderstorms cost $226.9 billion and killed 1,615 people. Flooding not associated with hurricanes cost $123.5 billion and killed 543 people. Wildfires cost $78.8 billion and killed 344 people. Winter storms cost $47.3 billion and killed 1,044 people. Crop freezes cost $30 billion and killed 162 people. Extreme weather events are especially damaging to agriculture. For example, Italy, world-renowned for its excellent olive oil, may have to import it instead. In 2018, extreme weather cut production by 57%. It cost businesses $1.13 billion. Heat-related deaths are one of the worst weather-related outcomes, killing 650 Americans each year. Global warming is hardest on city dwellers due to the urban heat island effect. Concrete and asphalt have made daytime temperatures 5 F hotter and nighttime temperatures 22 degrees hotter. Heat waves also worsen asthma. They encourage plants to produce "super pollen" that's larger and more allergenic. As a result, 50 million asthma and allergy sufferers would pay for increased health care costs. More intense extreme weather creates more infectious diseases. The World Health Organization reported higher rates of hepatitis C, SARS, and hantavirus. Sufferers came in contact with contaminated water from flooding sewage systems during floods. The increase in frequency and intensity of wildfires affects even those who don’t live nearby. The haze from the 2018 California wildfires drifted to New York and parts of New England. California utility Pacific Gas & Electric has filed for bankruptcy. It faced $30 billion in fire-related liability costs. Munich Re, the world's largest reinsurance firm, blamed global warming for $24 billion of losses in the California wildfires. It warned that insurance firms will have to raise premiums to cover rising costs from extreme weather. That could make insurance too expensive for most people. In 2017, forest fires were so monstrous that they pushed smoke into the Earth's stratosphere. It circled the globe within two weeks and remained there for months. The impact was comparable to a moderate volcanic eruption. A study by Pennsylvania State University predicted that extreme weather in North America will increase 50% by 2100. It will cost the U.S. government $112 billion per year, according to the U.S. Government Accountability Office. Between 2007 and 2017, it cost more than $350 billion. The airline industry may be next. Extreme weather affects the jet stream. In 2019, an ice storm in Canada combined with a heat wave in Florida made the jet stream speed up. It sent a Virgin Atlantic Boeing 787 hurtling across Pennsylvania at a record 801 mph. As the jet stream destabilizes, it could cause airline crashes. One of homo sapiens' secrets to survival could also be its downfall. Humans have an admirable ability to adapt. It’s what makes it one of the few species that can live anywhere on earth. But this same ability means people are likely to forget that the weather they are experiencing today is actually extreme. One of the dangers of fighting climate change is when extreme weather starts to feel normal. Adaptation won’t work when the change becomes too great. In the 2016 Paris Climate Agreement, nations agreed to keep temperatures from reaching a 2.0 C increase. They ideally would like to keep the increase below 1.5 C. But the system has yet to reach a new equilibrium. The amount of CO2 already released is enough to warm our planet by another 0.5 C.
If the world keeps emitting greenhouse gases at the current rate, average temperatures will reach the 2 C goal in 2037. It would create major changes. The Arctic would warm by 6 C. The U.S. Southwest would warm by 5.5 C. It would create near-permanent "superdroughts." If you want to support efforts to reduce the global warming that creates extreme weather, there are seven simple steps you can take today. Plant trees and other vegetation to halt deforestation. Become carbon neutral The United Nations program Climate Neutral Now allows you to offset all the carbon you've emitted by purchasing credits. It helps you calculate your specific carbon emission, or you can just use an average. These credits fund green initiatives throughout the world. You can select the specific project that interests you. Vote for candidates who promise a solution to global warming The Sunrise Movement is pressuring Congress to adopt a Green New Deal. It outlines steps that will reduce U.S annual greenhouse emissions from 2016 by 16%. That's what's needed to achieve the Paris Agreement's 2025 reduction target. Pressure corporations to disclose and act on their climate-related risks Since 1988, 100 companies have been responsible for more than 70% of greenhouse gas emissions. Sue the government In 2015, a group of Oregon teenagers sued the federal government for worsening global warming. They said the government's actions violated their rights and those of future generations under the U.S. Constitution. They point out that the government has known for over 50 years that fossil fuels cause climate change. Despite this knowledge, government regulations supported the spread of 25% of the world's carbon emissions. It asks the court to force the government to create a plan to change course. Enjoy a plant-based diet with less meat Monoculture crops to feed cows destroy forests. The Drawdown Coalition estimated those forests would have absorbed 39.3 gigatons of carbon dioxide. Slow deforestation by avoiding products using palm oil You can also avoid products such as guitars, furniture, and other products made from tropical hardwoods such as mahogany, cedar, rosewood, and ebony. Global warming is causing global climate change. It is the culprit behind the sharp increase of extreme weather events plaguing the world these past few decades. In the United States alone, each record-setting hurricane, wildfire, tornado, drought, and flood have cost billions in damages and an alarming death toll. The expense has contributed to our nation’s rising national deficit. The 2016 Paris Climate Agreement is a global effort. Its goal is to keep the earth’s temperature from dangerously increasing more than 2 C. If the current pace of carbon emissions is reduced, we will experience more and more extreme weather events. Life as we know it will change, as we struggle to radically adapt to enormous environmental pressures. Everyone must do their part now to reduce global warming by voting for legislation and leaders supporting environmental protection. We should decrease our demand for meat and palm oil products, increase efforts on reforestation, and be aware of our carbon emissions, to name a few.